In the 1970s, the stiff bouffant hairstyles of the past were replaced by soft, natural hairstyles. This made squeaky-clean hair an absolute necessity. Washing your hair became a daily ritual, and the market was flooded with new shampoo brands. Frizzies, split ends and oily hair could be eliminated with products containing natural ingredients like herbs, beer, wheat germ oil and honey. The early 1970s brought a new innovation in women's feminine hygiene: sanitary napkins with adhesive strips. Goodbye, belts and pins! How Do Pop Rocks Work? The plastic two-liter soda bottle was introduced in 1977. Aluminum soda cans with pull-tabs were introduced in 1963. Before this, cans were made of steel and were punched open with a church key can opener. Although pull-tabs were a great idea, there were some problems associated with them. Pull-tabs left a sharp edge around the opening and sometimes broke off prematurely. They also created a litter problem. In 1974, the problems created by pull-tabs were solved when the stay-on tab was introduced. The idea was controversial at first, because the procedure required inserting the metal tab into the soda, which people considered unsanitary. The public's fears were unfounded, however, and the stay-on tab was adopted by the entire soda industry. Opening instructions were printed on soda cans for the first few years. Visit my Electronics section to see more groovy products! 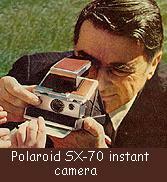 The Kodak Pocket Instamatic camera and Polaroid SX-70 instant camera both came out in 1972. The Polaroid was a real ice-breaker at parties....it was fun to watch the pictures develop right before your eyes! The Polaroid One-Step was a popular version of the SX-70 released in the late 1970s. For dark shots, we used Sylvania and G.E. flash cubes. "Next day" photo processing was only offered at camera specialty shops, so we usually waited several days to get our pictures back from the drugstore. Unfortunately for those of us with green or blue eyes, there wasn't any computerized red-eye correction, either. When the new magnetic photo albums came out, their sticky plastic-covered pages rendered photo-mounting corners obsolete. Many people still had their photos made into slides, which they could view with a projector or portable slide viewer. ....or looked at your slides in a slide viewer? In 1973, the Oldsmobile Toronado was the first GM car to roll off the assembly line equipped with an optional airbag. 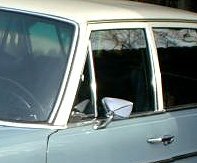 Before the 1970s, most cars had side vent windows: small triangle-shaped windows that passengers in the front seat could push open. A handful of models were designed without side vents in the 1960s. 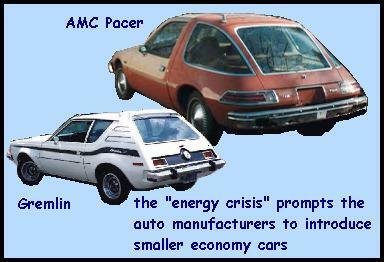 They were eliminated completely in the 1970s when automakers, in an effort to make cars more economical, removed them because they weren't aerodynamic. Customized vans were very big in the 1970s. Shag carpet and a great sound system inside, stunning artwork outside.